THE HEAVENS brings together new and recent works which continue the artist's interest in broad notions of space, time, distance and things, and the way in which these individual facets interact and their cumulative affect on our individual and collective understanding. At the centre of the exhibition is Actuality Reel_theheavens (2017), a series of videos Ireland has been creating since late 2015. This ongoing collection of short videos sees Jeff Koon's iconic Rabbit (1986) floating silently through the far reaches of outer space. In these videos, based on a recurring dream the artist had, Ireland conceives of Rabbit, with its mirror-polished, stainless steel skin reminiscent of the metallic veneer of NASA's Echo balloons (1960) and the shiny sphere of Sputnik 1 (1957), as a cryptic satellite moving through the universe occupying space as both transmitter and receiver. Ireland describes this ongoing series of videos as a consequence of his prolonged 'haunting' by Rabbit, a situation in which the sculpture is omnipresent. Alongside Actuality Reel_theheavens (2017) Ireland will be presenting And You've Felt The Horizon Havn't You? (2014/17); customised Levi's 501 Jeans, hand-dyed and stone washed with meteorites from a 16th century meteorite shower. This work is typical of Ireland approach to making artwork; seeking to flatten the space and shorten the distance between separate elements in order to exploit potential and expand possibilities. 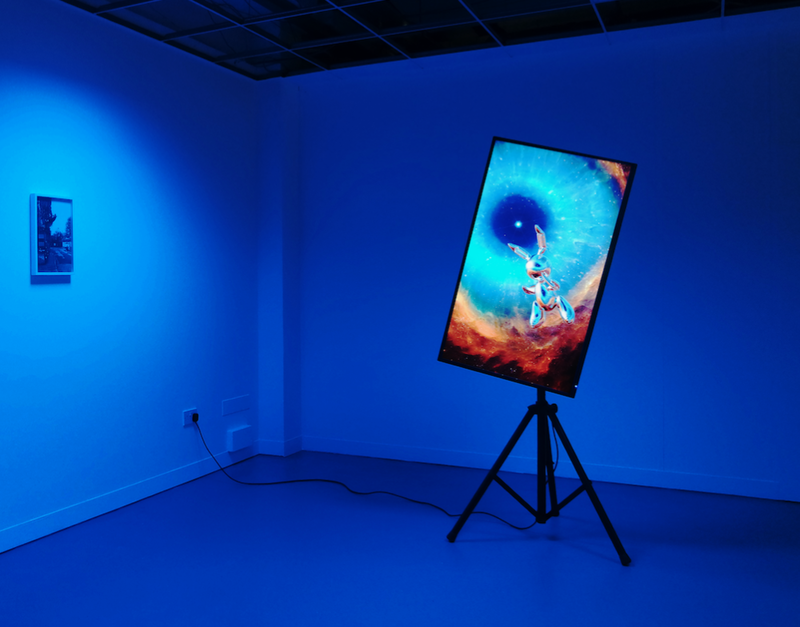 THE HEAVENS is the first exhibition launching arebyte LASER’s 2017 programme titled hotel generation - a series of paired exhibitions by a generation of young artists from around the UK, all responding to either contemporary Ordinaryism, information overload, collective practice or reacting to the ‘extreme present’. Tom Ireland (b.1984, Blackpool, UK) lives and works in Blackpool, UK. Ireland's recent solo and group exhibitions include; The Manchester Contemporary (2016) with OBJECT / A, Manchester, UK (group); MEANS (2016), UNIT Projects, Blackpool, UK (group); The Kármán Line (2016), OBJECT / A, Manchester, UK (group); Modern History Vol. 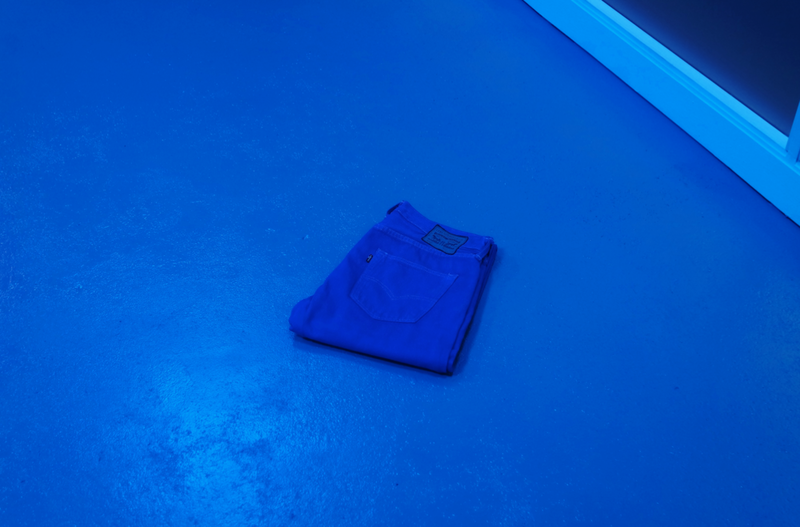 II (2015), The Atkinson, Southport UK (group, curated by Lynda Morris); They Used to Call it the Moon (2014), BALTIC Centre for Contemporary Art, Gateshead and BALTIC 39, Newcastle, UK (group); Strabismus: Exhibition as Cinema (2013), The Lombard Method, Birmingham and Mexico Project Space, Leeds, UK (group); But it could be a Levi’s advert, Eastside Projects, Birmingham, UK (as part of Flatfile, w/ Mathew Parkin); The Golden Coast, Untitled Gallery, Manchester, UK (solo); Easy Does it, David Dale Gallery (Glasgow), Aid & Abet (Cambridge), Supercollider Contemporary Art Projects (Blackpool). Ireland is represented by OBJECT / A.